The National Fund for Entrepreneurship Support (NFES) of Azerbaijan has provided preferential loans worth 114 million manats to businessmen since early 2017, the Economy Ministry said on November 30. The loans were allocated for about 1,700 business entities and will make it possible to create up to 5,100 jobs, according to the message. As part of a business forum held in the country’s Balakan district, entrepreneurs received preferential loans worth 874,000 manats. These funds will be used for the development of animal and poultry breeding, gardening, tobacco growing, production of furniture and other spheres. In general, entrepreneurs of Shaki-Zaqatala economic region have received preferential loans worth 102.4 million manats so far. It is planned to allocate 150 million manats through the NFES in 2017. 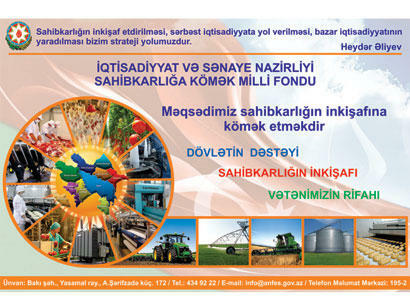 Azerbaijan’s NFES was established in 1992.